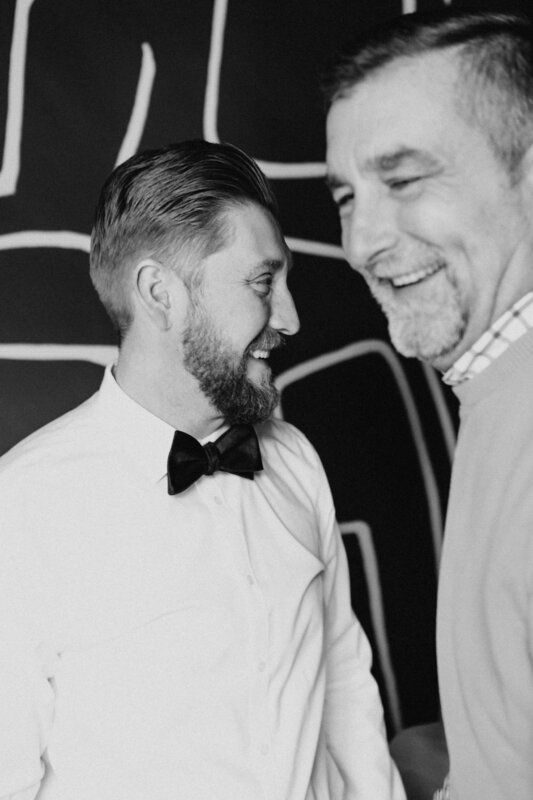 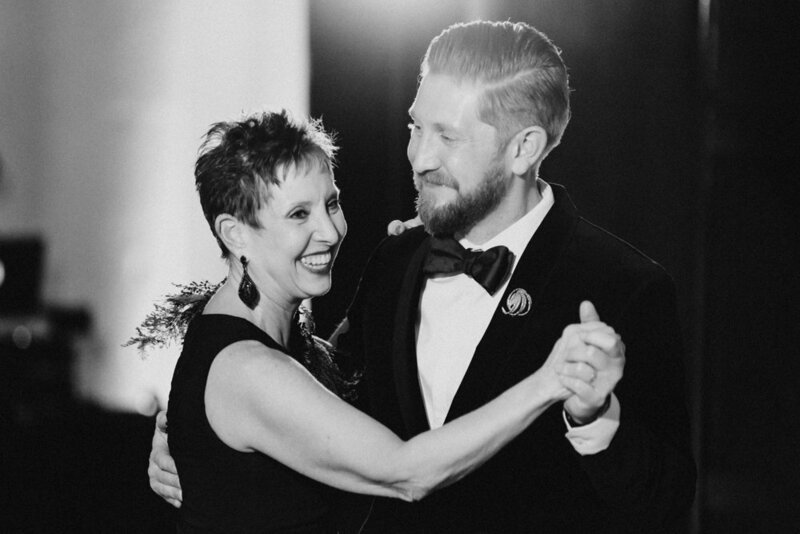 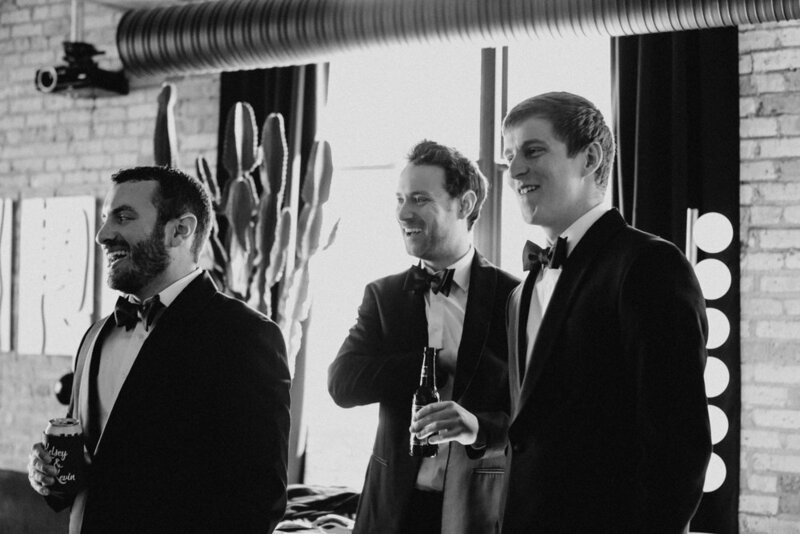 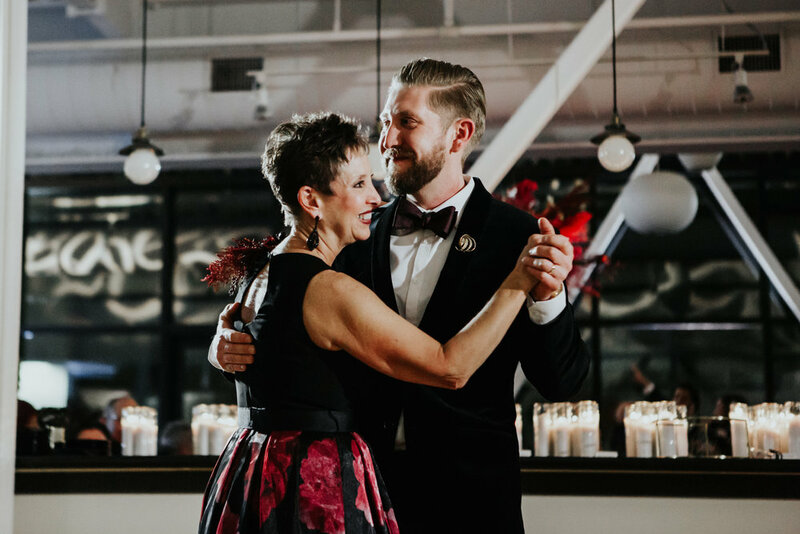 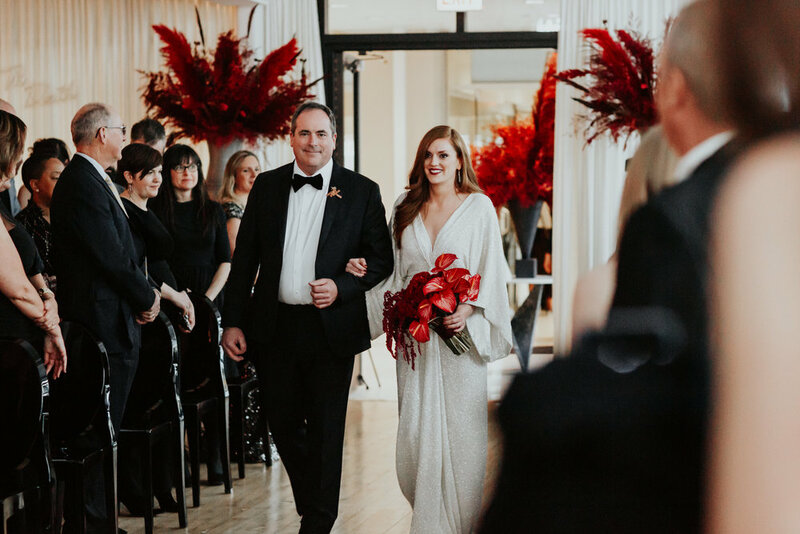 Lauren and Jim's wedding at Greenhouse Loft in Chicago was a perfect reflection of them--stylish, sophisticated, and boldly unique. 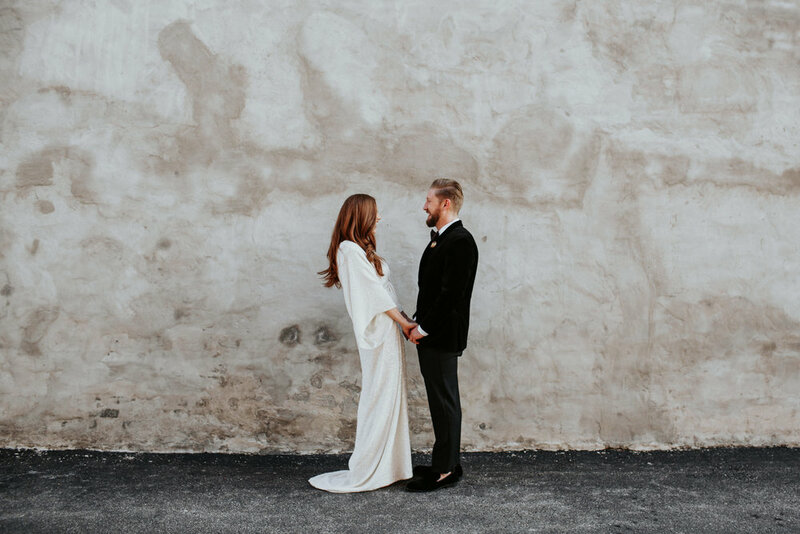 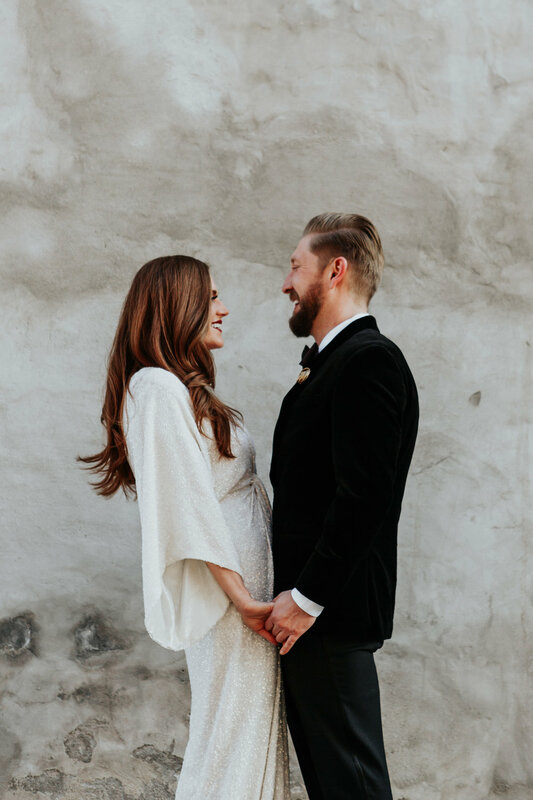 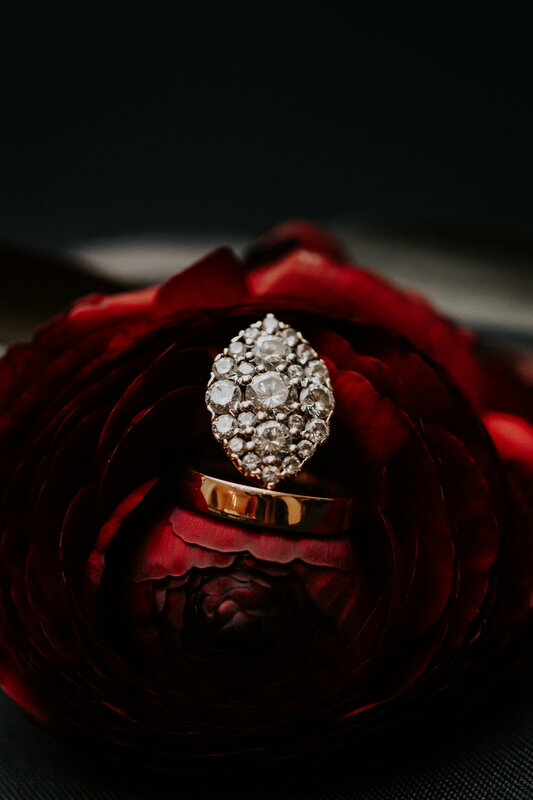 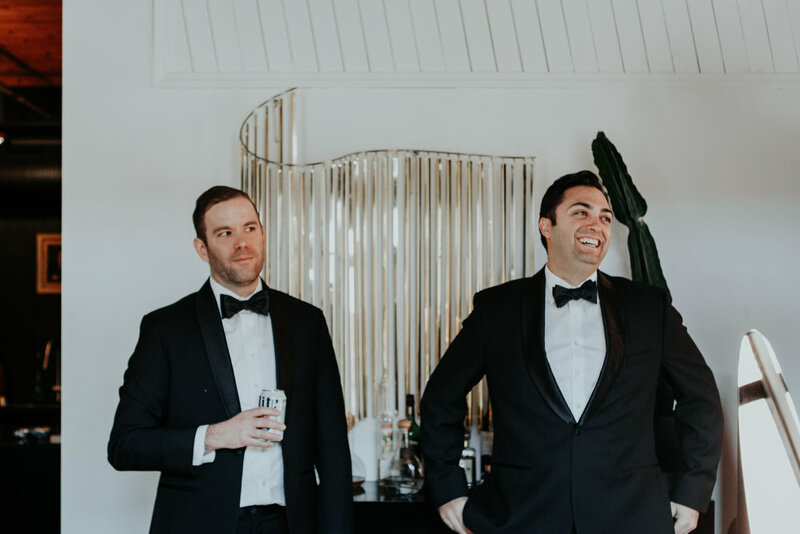 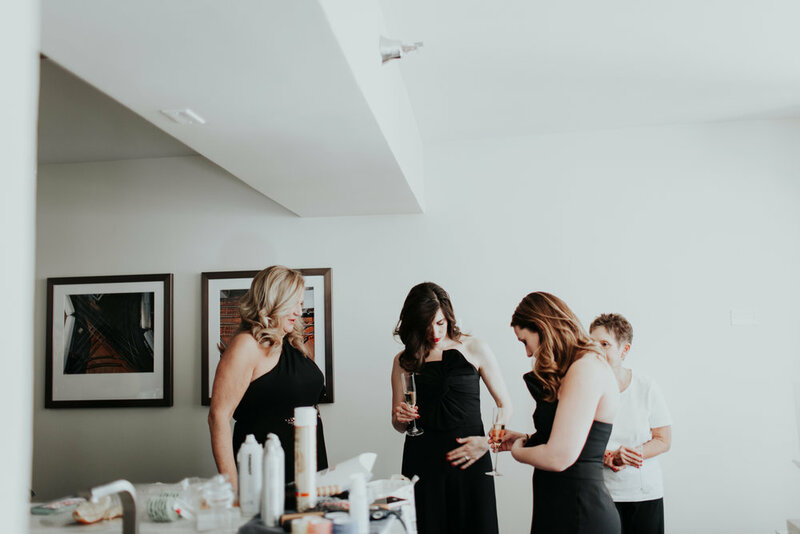 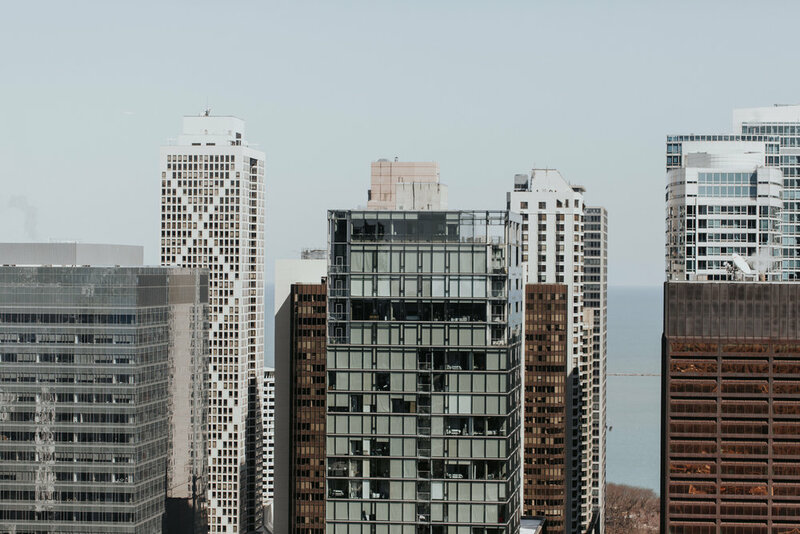 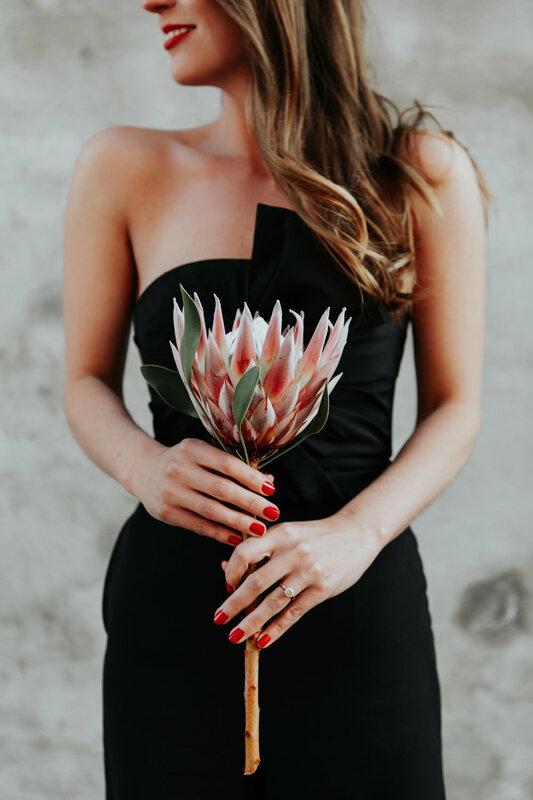 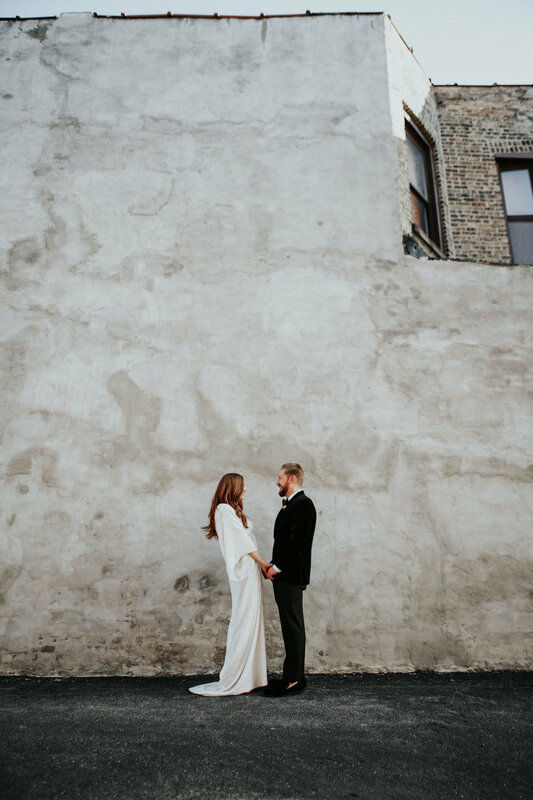 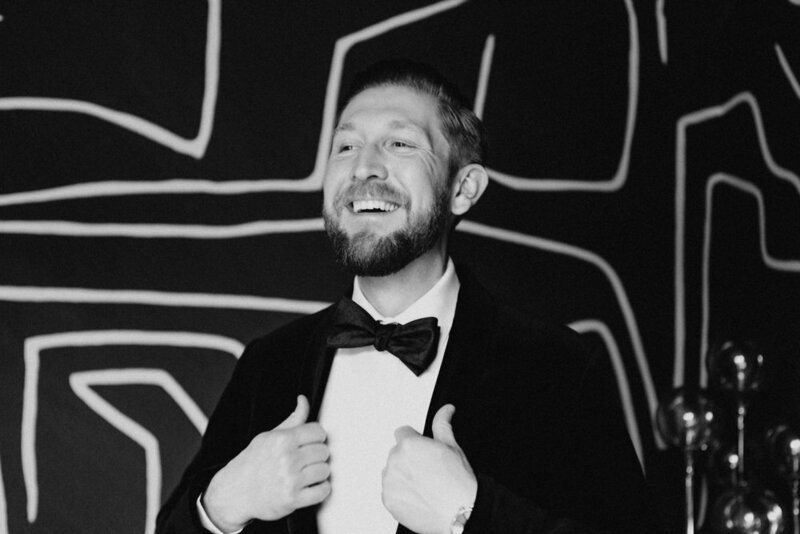 Lauren owns and runs the super-successful Chicago interior design firm Studio Sven, and every space she designs is daring and eclectic, so as her wedding photographer, I knew their day would be nothing short of spectacular. 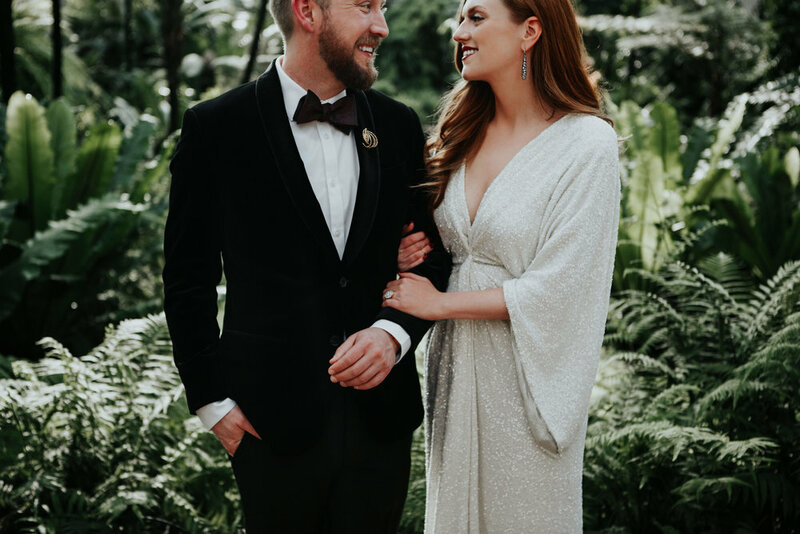 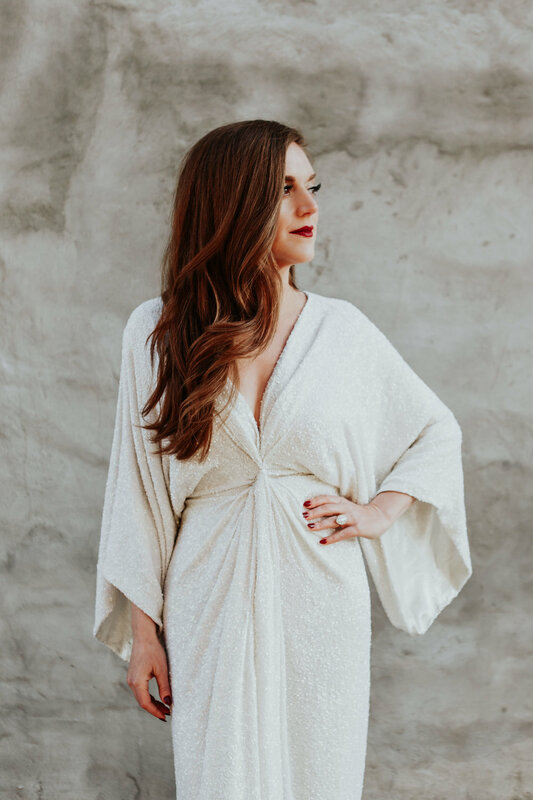 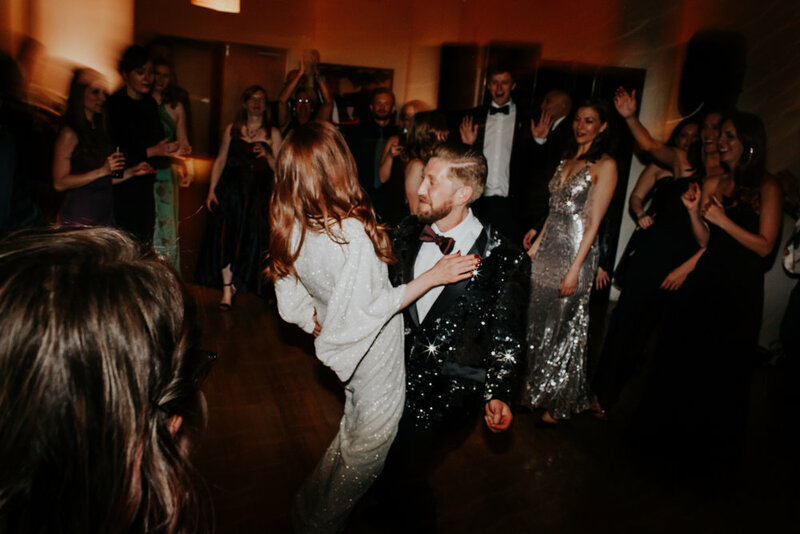 Lauren wore a custom white sequin kimono gown by Chicago designer Curtis Cassell, with her red hair styled in glamorous waves. 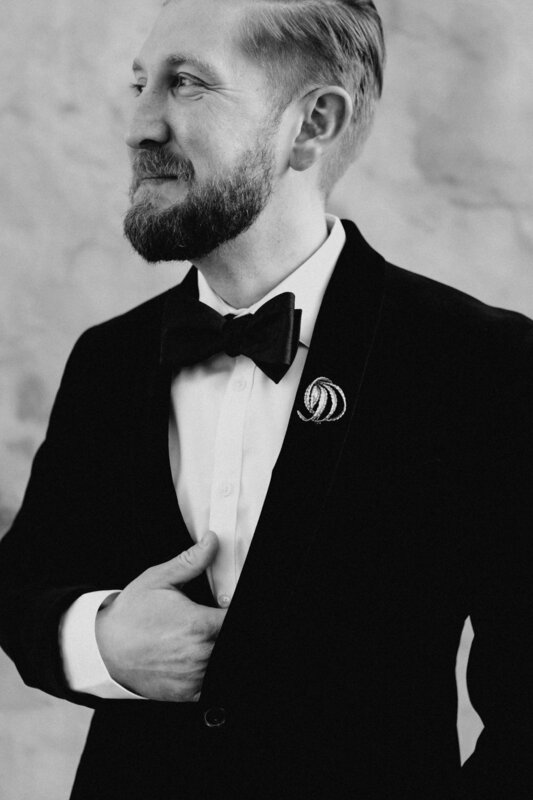 Jim wore a slim black velvet tux finished with a vintage gold brooch. 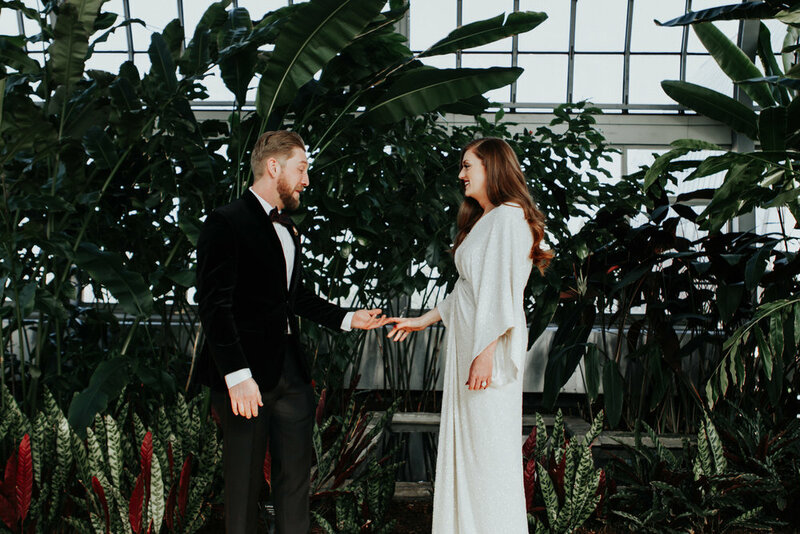 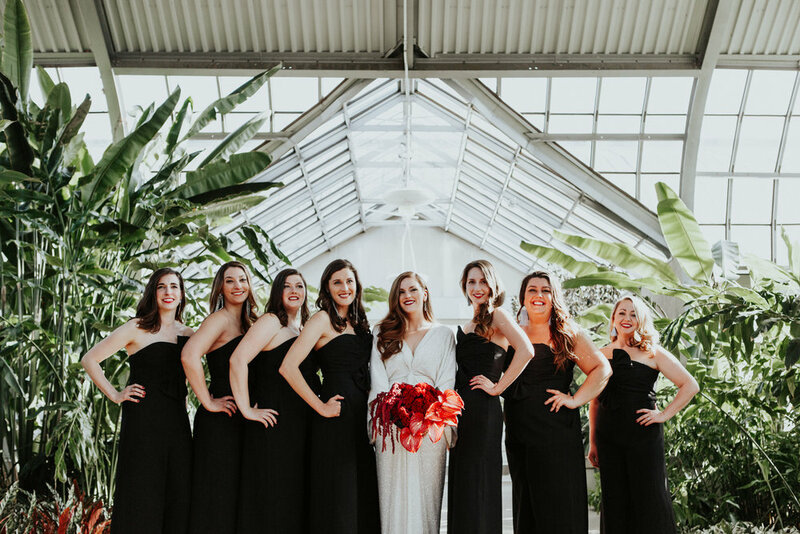 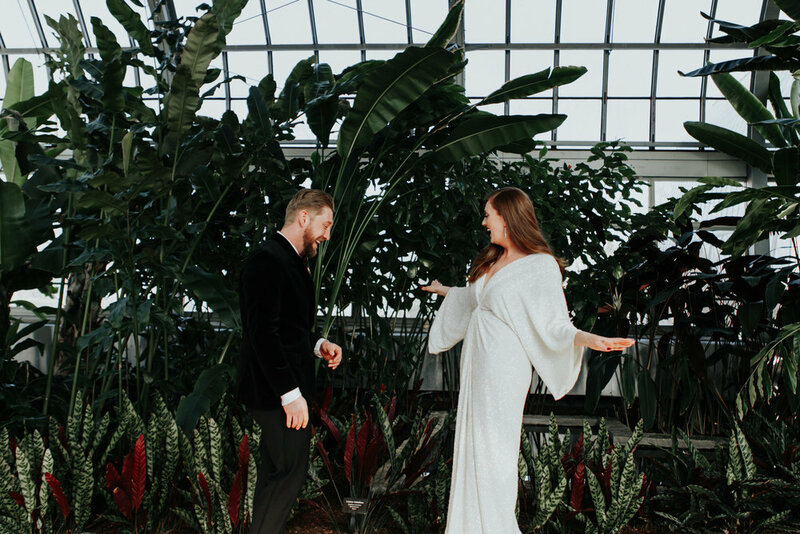 We traveled to one of our favorite Chicago locations, the Garfield Park Conservatory, for their first look and portraits amongst the lush greenery, before venturing outdoors and finding a beautifully weathered white wall backdrop to use. 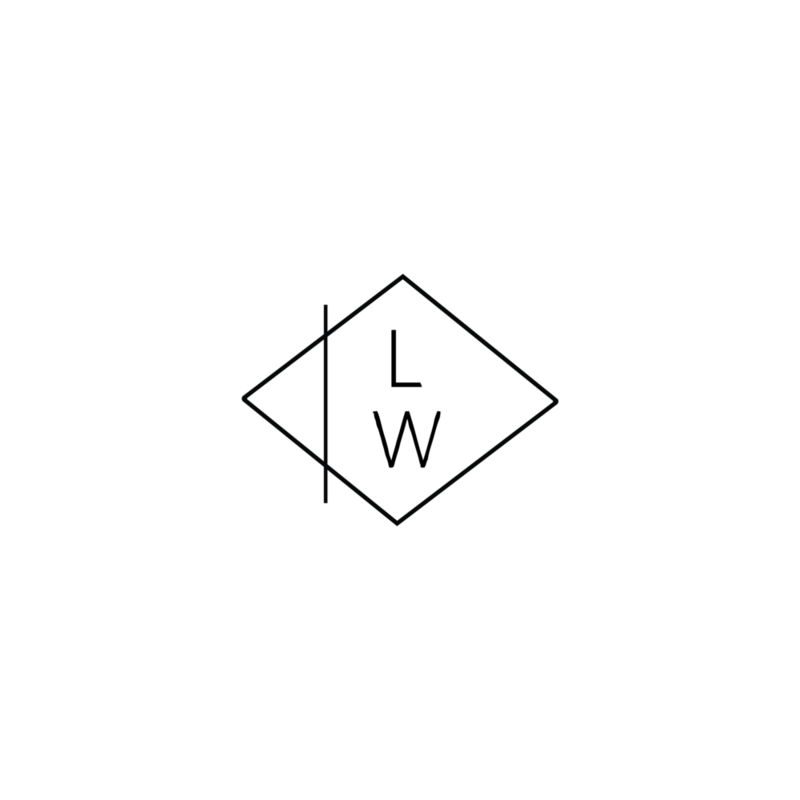 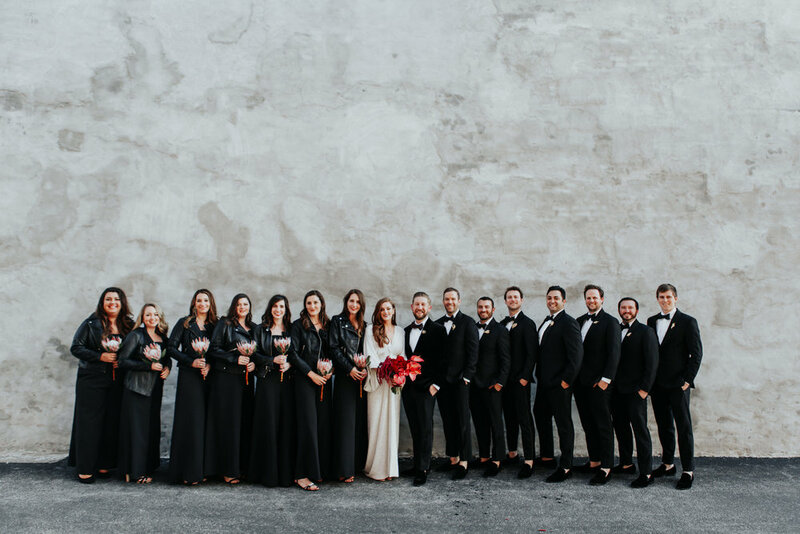 The wedding party exuded style, the boys in smart black tuxes and the girls in striking black jumpsuits with black leather jackets. 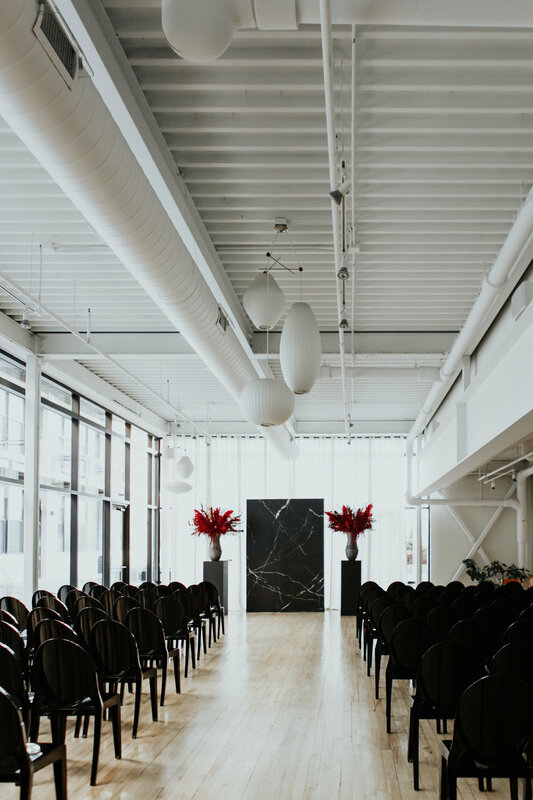 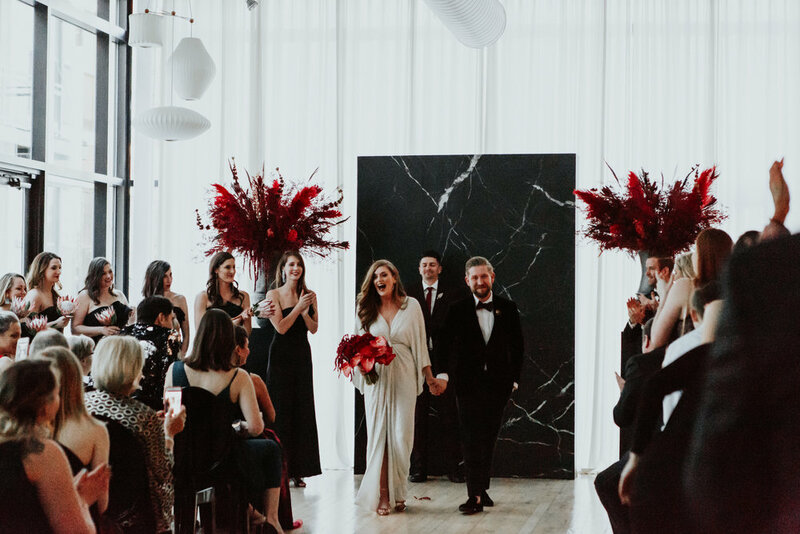 The ceremony space was equally as stunning, with a large black marble backdrop, large red floral arrangements, and black ghost chairs for the guests. 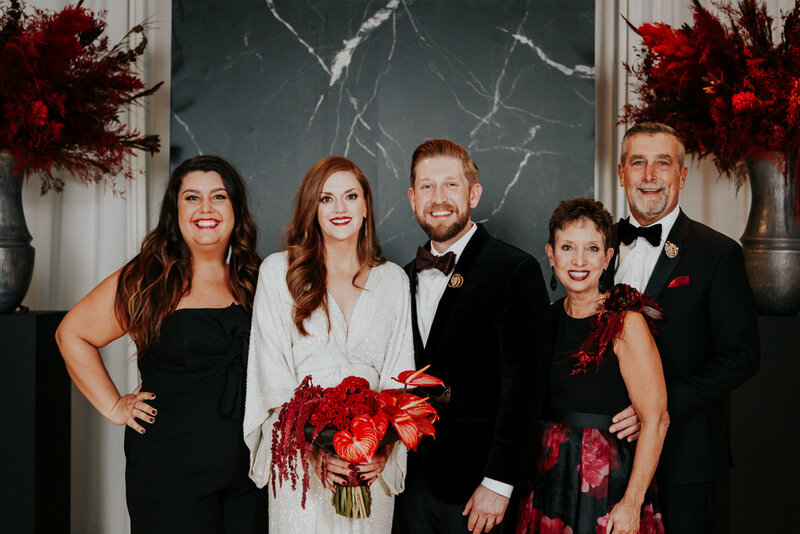 Lauren and Jim walked down the aisle to beautiful acoustic music played live by friends, spoke their handwritten vows, and then promised their love to one another before all of their family and friends. 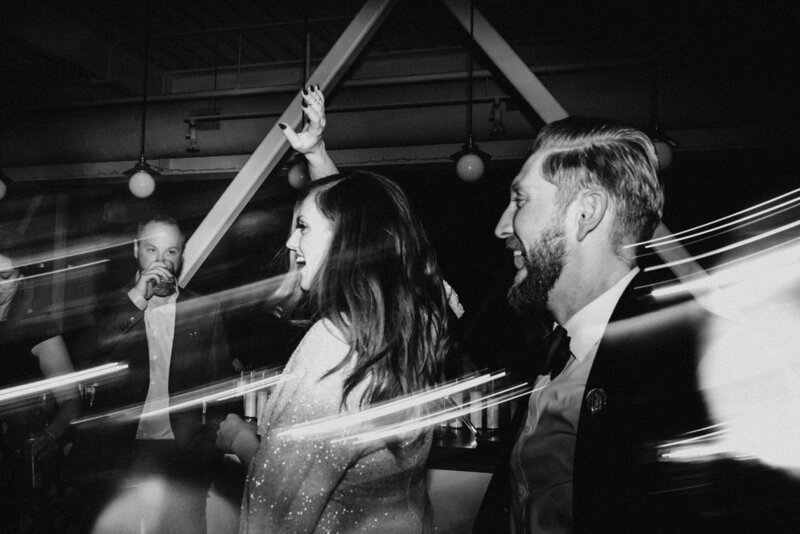 After that point, the party STARTED! 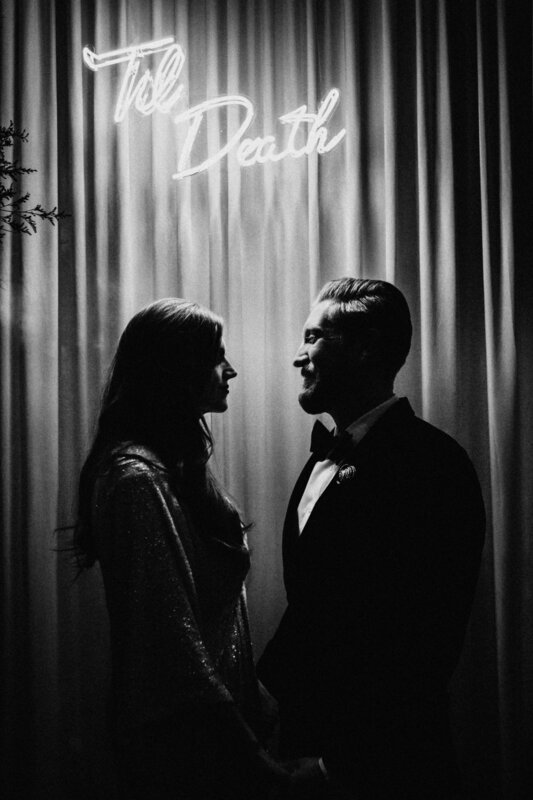 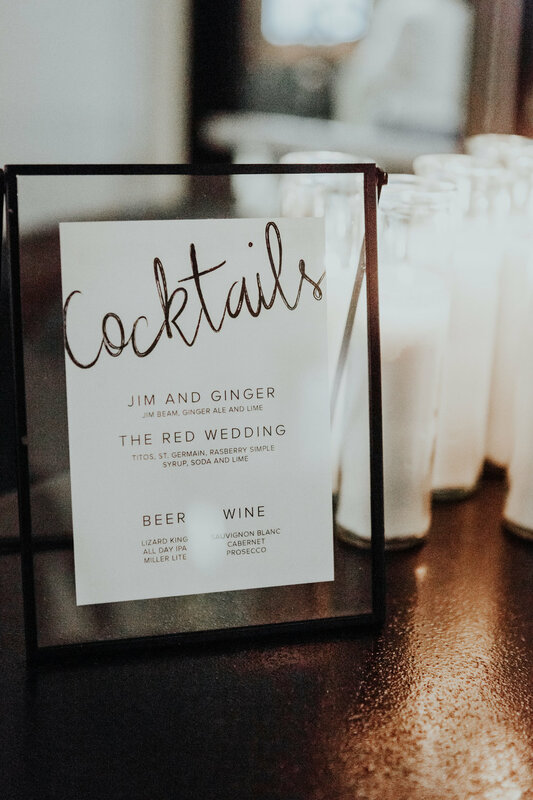 Their cocktail hour went into full swing as the staff completely transformed the space with hundreds of candles, daring porcupine quill centerpieces, and the edgiest sweetheart table I've ever seen. 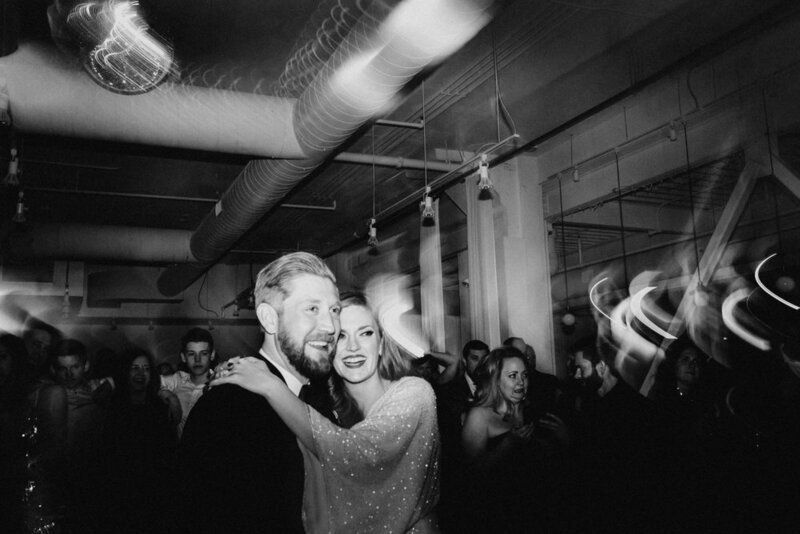 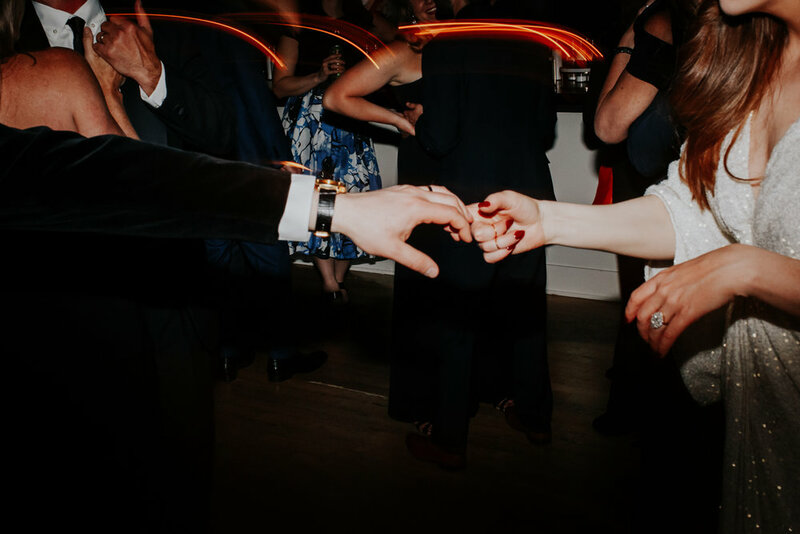 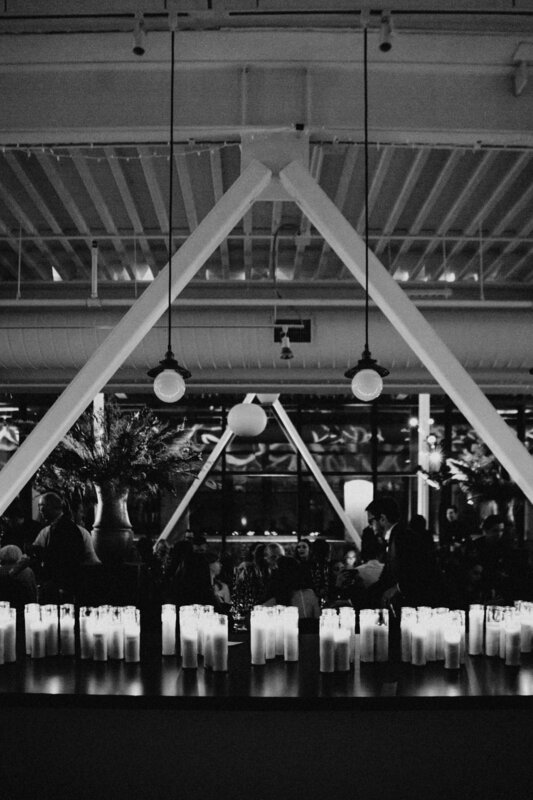 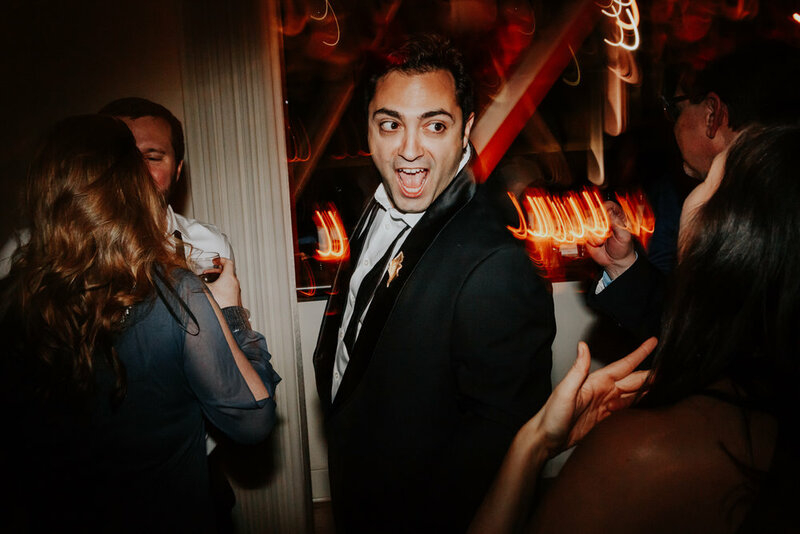 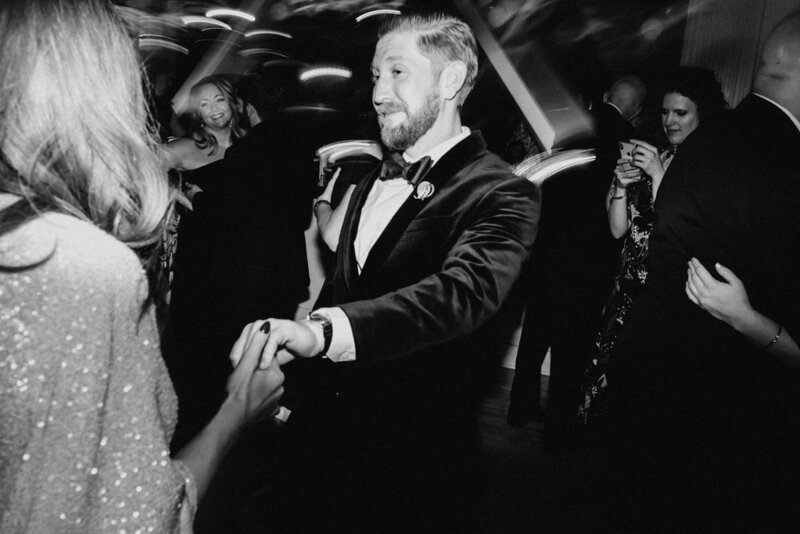 Lauren and Jim's wedding celebration lasted long into the night, the dance floor stayed packed, and they ended their epic night in true Windy City fashion—with Chicago style hot dogs!